For the best results, Isoloc joints should be routed with spiral upcut bits. 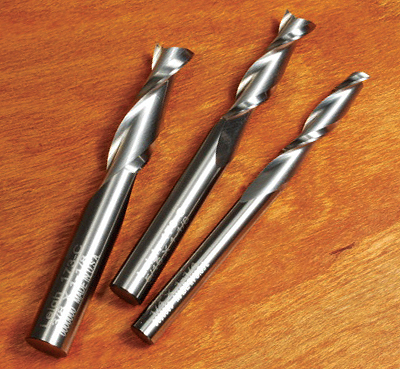 Leigh offers two variants: high speed steel and solid carbide. The spiral upcut design routs cleaner, faster, leaves a smoother finish and dramatically reduces tear out. They are ideally suited for the smooth organic curves of Isoloc joints. Although both produce excellent results, the solid carbide versions are stiffer and hold a keen edge longer than the HSS. The performance of less expensive HSS bits is comparable to solid carbide but lose their edge more quickly. Choose the bit that best suits your needs and budget. Note: The Isoloc bit set 1617I is only available in solid carbide. Bits with 5/16"(8mm) shanks require a 1/2" to 8mm collet reducer (Item 172-8) and bits with 3/8" shanks require a 1/2" to 3/8" collet reducer (Item 172-375). All standard Isoloc joints are routed with a 5/16" (8mm) diameter bit. 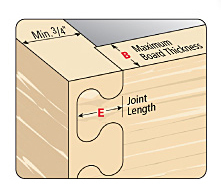 Inlaid and shadow Isoloc joints require two additional router bits, specifically 1/4" and 3/8". Pin boards for regular Isoloc joints must be 3/4" thick or greater. Socket boards may be any thickness between 1/8" and 1 1/4". Leigh recommends the use of a plunge router for Isoloc joints. The cutting flute length of the bit (B) must be equal to or greater than the thickness of the tail board (B). 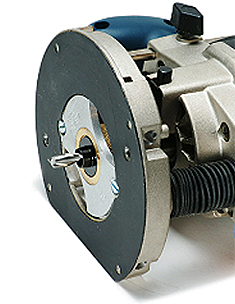 All Isoloc routing requires the use of the VGS Variable Guidebush System. 5/16" 1/8"-1" 5/16" 3" 5/8"
3/8" 1/8"-1" 3/8" 3" 5/8"
1/4" 1/8"- 1 1/4" 1/4" 3" 5/8"
5/16" 1/8"-1 1/4" 5/16" 3" 5/8"
3/8" 1/8"-1 1/4" 3/8" 3" 5/8"
Includes 1/4" (168C), 5/16" (170C) and 3/8" (173C) bits.